State and test mathematical conjectures. Understand and use alternative methods of proof. Before the lesson, students attempt the Consecutive Sums task individually. You review their responses and formulate questions for students to consider in order to improve their work. 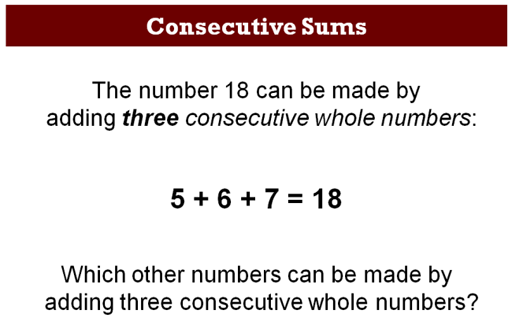 Next, students consider a conjecture about the sums of four consecutive whole numbers before looking in pairs at some sample work in which other students attempt to justify the conjecture. They seek to improve the arguments given and compare the different approaches used. In the same small groups, students then work together to classify other conjectures about consecutive sums according to whether they are always, sometimes or never true. In a whole-class discussion, students discuss their categorization of the conjectures. Finally, students reflect individually on the different approaches seen and used. Each individual student will need some plain paper to work on, a copy of the Consecutive Sums task, a mini-whiteboard, pen and eraser and a copy of the How Did You Work? questionnaire. Each small group of students will need copies of the four Sample Responses to Discuss, cut-up copies of Sample Conjectures to Discuss, (cut-up copies of Sample Conjectures to Discuss (Extension) and Blank Cards may be needed for those who complete the main task), a sheet of poster paper, a marker and a glue stick. Provide calculators for students who wish to use them. There is a projector resource to help to introduce activities and support whole-class discussions. 20 minutes before the lesson and a 120-minute lesson (or two 60-minute lessons). Timings given are approximate. Exact timings will depend on the needs of your class. An optional follow-up lesson could be used to develop the task further, with students creating and proving further conjectures in relation to the consecutive sums problem. 6.EE: Apply and extend previous understandings of arithmetic to algebraic expressions.